No, sir: wood floors are not considered the best choice for kitchens. So that's why it's so fun to bend--even break--the rules a bit. Wood flooring in kitchens isn't as bad a choice as in bathrooms. Bathrooms' high moisture--it comes from all directions, from bathtub overflows to sink spills and humidity--make solid hardwood a horribly bad choice and engineered wood only slightly so. These homeowners threw caution to the wind and floored their kitchens in wood. Imagine that! If you want a rustic-styled kitchen, you need to floor it in wood. And that wood must be plank. Furthermore, you must stalk that most elusive of all beasts: long, continuous planks. You are now viewing the kind of plank that people kill for. This is true plank. When Al Kellogg, over at Kellogg Hardwood Lumber, spoke with us some time ago, he told us that the kind of plank floor you buy at most retailers is called box plank. Box plank comes in nested bundles of pieces that might be as long as five or six feet, but are often shorter. Kellogg says this creates a "mosaic look," chaotic and jumbled and frazzled. By contrast, long, continuous plank boards create a room that looks calm, orderly, Scandinavian, and very much in control. Black wood flooring in a kitchen? It's a style, it's a look. You obliterate wood's meaning when you stain it coal-black. The only quality of wood that remains is the wood grain, which is visible only from certain angles of light. Wood, like alcohol, is best used in moderation. Intelligent, well-placed touches of wood can transform a staid, dull kitchen into a warm gathering place. But is it possible to go too far? Let's count all of the natural (stained only, not painted) wood elements in this kitchen: flooring, beams, cabinets, door trim, window trim, kitchen island. The only non-appliance things that are not wood are the subway tile and quartz countertops. Is this really a cabin in the woods or just trying to look like it? Either way, it doesn't matter: these owners have the look down pat. This kitchen employs its white oak flooring to great effect: the flooring is meek enough to step back and let other woodsy elements of the kitchen take the forefront. This is what you might call the retro-country style. Edison bulbs and old-school fridge are combined with white pine paneling and a generously open beam ceiling. Wood flooring, when done right, can work miracles in a kitchen. Imagine this ultra-modern, Euro-style kitchen with a glossy black porcelain floor. It would be so cold and forbidding, you would never want to cook another meal in there. Instead, this natural wood parquet flooring instantly warms up the white IKEA thermofoil cabinets and chilly Arctic ice mosaic tile backsplash behind the sink. This is an example of a kitchen whose designer or owner who did not know where to stop. Wood is great, but enough already. For that gorgeous distressed wood flooring to shine through, you would need to tone down the rest of the kitchen. Design is about the balance of contrasting elements: the rough and the smooth, the light and the dark. With this all-wood kitchen, there is no balance. The kitchen is like that car that pulls up to you at the stop light with music blasting at you. But unlike the car, this kitchen never goes away. Who's the star of the show in this kitchen? The kitchen itself or the wood flooring? Wide plank commodity flooring injects this open-plan kitchen/living room with much-needed vitality. 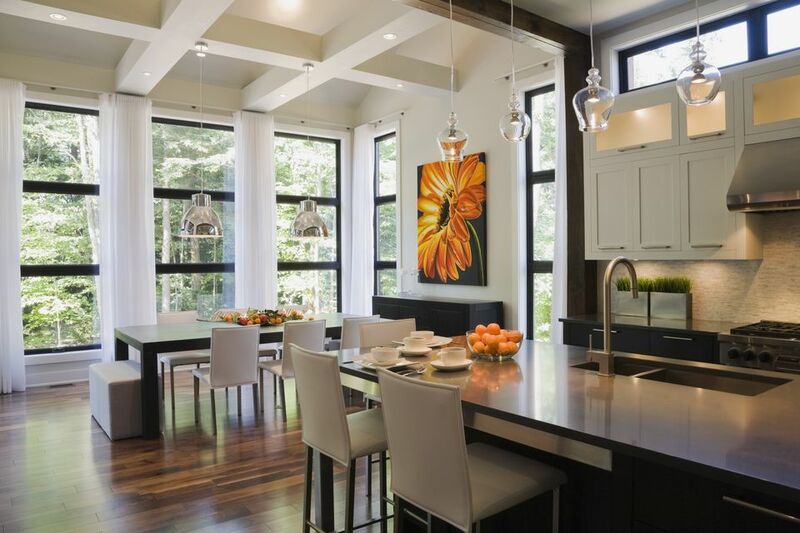 These modern kitchens, with their slab cabinets, stainless steel appliances, and recessed lights, tend to be all about reduction and diminishing and flattening. That's why a deeply streaked wood floor like this one provides loads of punch, vigor, and visual stand-out features. This kitchen in a Hamburg, Germany condo benefits from the dark wood floor that extends throughout the entire unit. What saves this very dark floor from swallowing up the apartment is the introduction of lighter-shade floor boards. Sometimes, it's the little touches that can turn the look of a room. With all of the white in this kitchen--cream or white cabinets, white subway tile, white paint--the worst flooring would be something like white octagonal tile or 16" white porcelain. Natural wood flooring, though, swoops in to save the day. This is one case where you can do wildly contrasting floorboards--some dark, some light, some in-between. And it all works, because of the neutral canvas that this kitchen provides.